Does my engine need a major or minor overhaul? How long does an engine last? The short answer is that age is no indicator. Heavily used commercial road vehicles, even small ones such as taxis, can be expected to run 500,000 miles, perhaps 12,500 hours, with perhaps a change of big-end bearings but possibly not. Few auxiliary yacht engines come anywhere near this. Power boats will certainly do better than yachts but it is rare for one to last 10,000 hours without complete overhaul. Diesels thrive on hard, constant work that keeps them up to working temperature for most of the time. What they don’t like is frequent start-stops, brief periods of operation, rarely reaching design operating temperature, living in a cold, moist atmosphere and infrequent oil changes. Which is what they get, at least in yachts. Given that hours run is insufficient guide to judge engine condition, how can the practical, non-specialist owner judge whether his engine is in good condition, would benefit from some maintenance or needs a total overhaul? Much can be learned from observing the type of smoke emitted by distressed diesel engines. Black smoke from exhaust Cause is incomplete fuel combustion. Can be due to injector problems, high load, poor compression and valve wear. If the smoke has always been present it could be that the propeller is over-sized. If it comes on fairly suddenly, check for hull fouling, something wrapped around the keel or some foreign material such as net, polythene or rope around the propeller. A further cause, when black smoke is accompanied by a severe reduction in maximum revs, is blockage of the exhaust manifold by salts. Blue smoke from exhaust Cause is burning engine oil that has found its way into the combustion chamber. A little is normal on start-up until the pistons and rings warm and seat fully, but if it continues the likely cause is wear of oil control rings and/or bores. White smoke from exhaust Two possibilities: either unburned fuel or steam. Holding a cool mirror or glass bottle in the flow can help to identify which it is. Note that Bukh engines are renowned for steaming from a couple of minutes after starting. Unburned fuel indicates that at least one cylinder is not firing. If no other faults are seen it is likely that the injector spray pattern needs attention. Oily grey smoke coming out of the open oil filler cap and crankcase breather hose in significant amounts with the engine warm and running, possibly with a smell of diesel fuel. Shows that combustion pressure is passing down the bores into the crankcase. Likely causes could be broken or worn rings, badly worn pistons, and possibly worn or deeply scored cylinder(s). Best confirmation of worn bores, or at the very least broken oil control rings, is that oil consumption will be high. An engine in good condition will consume a small amount, perhaps 0.5 to 1.0 litres per 100 hours; higher figures are suspect. Large amounts of blue smoke from the exhaust after periods of tick-over, disappearing soon after revs are increased, probably indicates worn valve guides. Little puffs of white smoke which smell of diesel from the exhaust on starting from cold. Almost certainly the engine has a compression problem. Diesels are naturally more noisy than petrol engines. The loud combustion noise of a diesel can drown some minor rattles but it should be possible to detect anything really serious. Fortunately, the noises produced by piston/bore wear and knocking big-end bearings are fairly easy to confirm by smoke emissions and low oil pressure, respectively. These are the two conditions that need treatment on a fairly urgent basis. Conversely, noises from lesser problems, like timing chains, tappets and even fuel injectors, are amplified by the covers against which they are knocking, with the result that they can sound almost terminal. So my advice is not to put too much reliance in noise levels but to look for confirmation by other means. There’s one exception: with very low engine power, a loud clanking sound coming from the engine at the expected rate of one cylinder firing. The sound seems to be coming from the top of the engine and is more obvious with the filler cap off. The likely cause is a broken valve spring. Unlike gasoline engines, for which compression testing equipment can be bought cheaply at your local car parts shop, the equipment needed for diesel compression testing is specialised and expensive. Firstly, the fittings for injectors and/or glow plugs are not standard and almost every major manufacturer uses a different type. Thus a custom built, and inevitably more expensive, connector is needed for each engine type. Secondly, the pressure involved can be a lot higher and the test equipment is built to a superior and safer standard. Compression testing is better carried out by a professional, but only after the owner has made some preliminary checks that will give almost the same information. If you are able to borrow or hire the correct tester, compression tests should be taken when the engine is at operating temperature. Remove a glow plug or injector, screw in an adapter and connect the pressure gauge. Measured pressure for engines varies considerably, perhaps between 200 and 500 p.s.i., dependent upon design and condition. It is far more important that the measured pressure is similar for all of the cylinders than that the value is a certain figure. However, a very low figure would indicate that all cylinders were worn. You can make a good subjective judgement of the compression of an engine by turning it over manually. You will need a socket that fits the crankshaft pulley nut and a tommy bar that fits the square drive. These nuts are sometimes larger than is provided in the average socket set, in which case buy one, but as it will not be taking any significant load the cheapest sold by your neighbourhood car parts shop will be quite good enough. Bukh and older Volvo engines may not have a single nut but you should be able to turn the flywheel instead, after padding the starter ring with a rag. Make your initial test with the engine completely cold. Fit the socket and tommy bar to the pulley nut and turn in the direction of rotation. The effort required to rotate a healthy diesel engine through its compression stroke top-dead-centre is considerable. Turn the engine over enough times that each cylinder goes through its firing stroke, i.e. one 360 degree rotation per number of cylinders. There should be no obvious difference in effort for any of them. If there is, you can tell which is the faulty cylinder by watching the valves, after removing the valve cover. The firing cylinder is the one that has both valves closed at TDC. Assuming the rotation effort to be less than expected, the next step is to repeat the test with oil in the bores. Remove the air filter. Turn the engine over on the starter motor with the decompression levers or other stop device activated, whilst at the same time squirting oil into the inlet manifold. Let the engine sit for a couple of minutes to allow the lubricant to drain down the bores and settle on to the piston rings, where it will make a good, if temporary, seal against the cylinder bores. Rotate the engine again. If general compression levels are markedly higher there is a strong indication that the rings are worn, whereas a continuing poor compression level suggests that the problem lies with the valves. Uneven rotation effort both with and without oil added is probably due to one faulty valve but one (or more) badly damaged piston, rings or bore could be the culprit. Taken in conjunction with the evidence of smoke signals you should now have a good idea of the engine’s condition. If you have diagnosed loss of compression, in past days, and with a common automobile type of engine, now would be the time to remove the cylinder head to look inside. In view of the extortionate cost of cylinder head gaskets for small specialist marine diesels it is questionable whether this can be justified. If there is a strong suspicion that problems lie within the cylinder head, or that bore wear has reached unacceptable levels, then removal of the head to establish the cause of the problem prior to commencing more major work is a sensible move. Exploratory removal of the head may still be justifiable and worth exploring with automotive-derived engines such as Thorneycroft, for which gaskets are available for a much more reasonable cost. If the test findings are that the valves are the problem, one lifeline may be that the tappets are too tight, holding the valves open a little when nominally closed. It is worthwhile checking that there is some clearance on every one. The trick is, for many 4-cylinder, 8-valve engines, to check the clearance of No.1 with No.8 fully down, No.2 with No.7 fully down, etc. The same applies no matter the number of cylinders, always add up to one more than the total number of valves. (Owners of 4-valve per cylinder V-8s check your manual!) The problem is that valves that have been in this tight clearance condition for an appreciable time will have burnt and no amount of adjustment will restore them to good sealing. If this check brings no further relief it may at this stage be worth investing in a “proper” compression test, before deciding whether to fund a fairly major overhaul or even a new engine. An engine that starts within a few seconds of cranking, from cold, almost certainly has no compression problem. If it fires up, but runs erratically until warm, it probably has a compression problem on just one or two cylinders. If it does not start easily it may be due to compression but it could equally be a problem with a variety of other things. A poor-starting engine that looks OK on compression testing could have glow-plug, fuel or air problems. Oil pressure is the best guide to oil system condition, including pump and all bearings. Few small boat engines are equipped with an oil pressure gauge. Fortunately, the oil pressure switch that is screwed into the block has a thread that is common to the ones used in many automotive applications. This means that you can buy a cheap pressure gauge from your car parts shop that will substitute for the switch. If you want to fit the gauge permanently you can buy a T-piece that will take the gauge fitting and the pressure switch. An engine in good condition started from cold will have an oil pressure of maybe 45-65 psi, as determined by the setting of the oil pressure relief valve, both at tick-over and higher revs. As the engine approaches normal operating temperature the oil viscosity reduces, increasing leakage through the various small clearances in the engine. Engines in good condition will retain a pressure at speed that is similar to the original value, whilst at tick-over it will reduce somewhat, perhaps to somewhere around 30 psi. A worn engine may have a running pressure of 30 – 35 psi and a tick-over pressure as low as 15 – 20 psi. At this level the pressure switch light may be flickering or permanently on. Work on diesel engines can be roughly classified into high, medium and low cost, although everything is relative and even “low cost” can lead to sharp intake of breath. 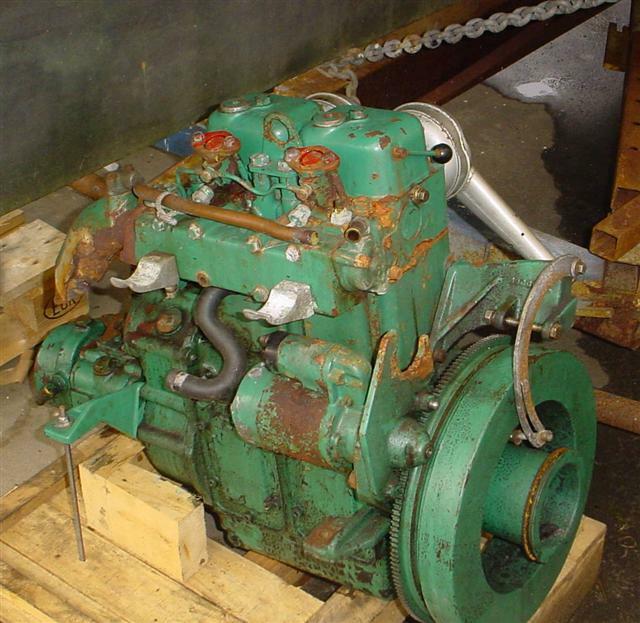 Work that needs engineering skills and equipment to be applied away from the boat, and is therefore high cost,would include rebores, crankshaft regrinds and cylinder head rebuilds with valves. 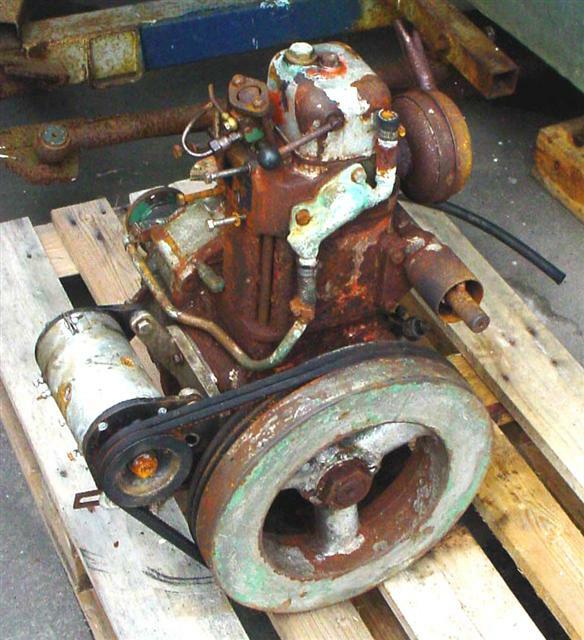 In many cases the cost of the replacement parts needed for this type of work is now so high that a new engine is the only economic choice, unless the owner can carry out the majority of the disassembly and rebuild himself. 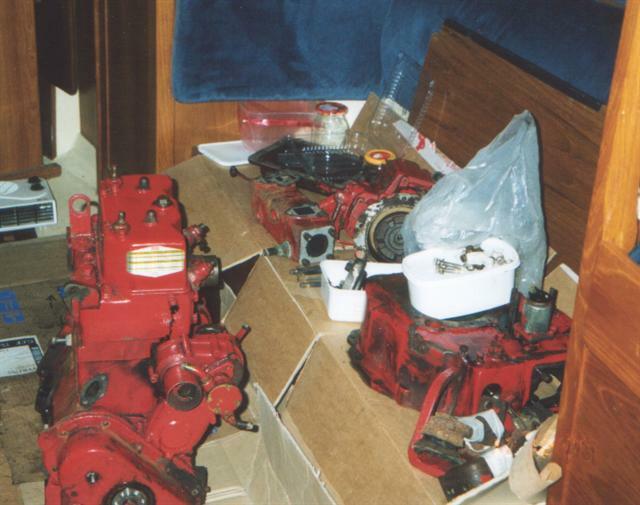 Removing engines from boats can be a major task but is by no means prohibitive for many owners. Even heavy old engines with massive flywheels can be lifted using the boom and halyards, with a chain block holding the engine. 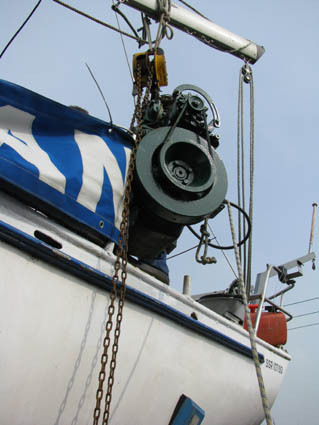 Attaching the chain block and halyards to the centre of the boom reduces the load on the gooseneck. In some cases the engine can be stripped without lifting it from the boat, useful where the boat is berthed on a finger pontoon. Here the saloon has been protected with flattened cardboard boxes and old carpet tiles. The engine was rolled down a plank after lifting it onto a skateboard. Medium cost work will be anything that requires the purchase of specialised parts such as bearings, oil pump, valves and full engine gasket sets. In work within this category carried out by a yard, the cost of the parts is a small proportion of the total bill and it will repay the owner to carry out most of it himself. As ever, having any specialist work such as valve guide replacement, valve seat cutting and the like done by an automotive shop will be a far cheaper route. A cylinder head gasket for one of the popular small multicylinder engines like Volvo, Yanmar or Bukh can cost about £100. A full engine set will cost not much short of £200. Few people could make a cylinder head gasket, but almost anyone could make the others. Since the age of 10, my daughter has been cutting gaskets for me, using only a pair of scissors. The raw materials, Klingerit, cork and heavy paper, are available in sheet form from any automotive supplier at very low cost. There is no magic involved, just patience and care. It helps to have a few extra tools like punches and a small ballpein hammer but these are not essential. Any metal seals and O-rings that are needed can usually be purchased separately. Incidentally, old marine charts are an excellent material for making your own gaskets! I have left low cost work until the end, as I struggled to think of very much. Routine jobs like filters and anodes not included, the only checks and adjustments normally needed are to tappets. Front and rear oil seals are cheap but changing the rear one will require separation of the gearbox from the engine and this may only be possible after lifting the whole assembly out. Replacement of collapsed or broken engine mounts barely sneaks into the low-cost bracket, at anything up to £100 each! Having injectors professionally cleaned and spray patterns tested is well worth the cost about every five years.